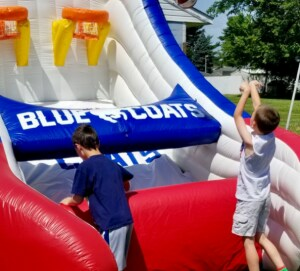 If you’ve been to or plan to attend a community event or festival in Delaware this summer, there is a good chance you will run into Coach Joe and his giant Blue Shoe. The Blue Coats attend more than 100 events per year. That’s a lot of opportunities for Richmond to recruit new fans of the team. Richmond message is always clear: it goes beyond basketball. The Blue Coats have prioritized community improvement and first-class fan experience. The team’s unique theme nights, zany on-court contests and rapidly growing youth literacy program are examples. “Basketball is just the vehicle in which we deliver our messages, especially to kids,” Richmond said. A year ago, Richmond helped launch the first ever Delaware-based NBA G League affiliated youth basketball camp at the Wilmington PAL. During the past basketball season, Richmond held Courtside Clinics during four separate Blue Coats games, where youth skills and drills sessions occurred just off the G League playing surface. 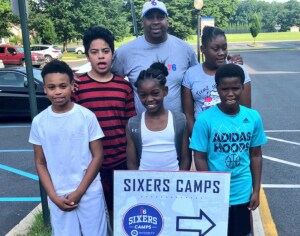 This summer, Richmond will help lead both Sixers Camps being held in Delaware (Wilmington Friends June 18-23; Tatnall School August 6-10). Prior to his role with the Blue Coats and Globetrotters, with whom he toured for five years, Richmond played and coached professionally in Sweden. He then became the head coach at Delaware Valley Charter School, managed the Delaware Sportsplex and later served as co-owner of the semi-professional Delaware Destroyers. Richmond and his brother, “Big Mike”, a standout at UTEP and 1987 NBA Draft Selection of the Dallas Mavericks, currently own and operate I Am Focused FINEST, Inc., a non-profit organization that mentors young basketball players in Delaware and beyond.